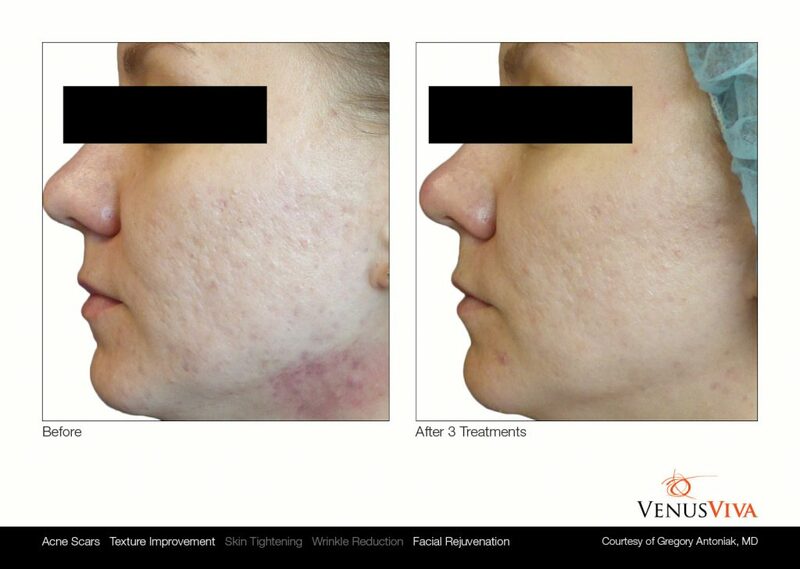 The Venus Viva is an FDA approved skin resurfacing treatment to improve the appearance of scarring, wrinkles, stretch marks, skin texture and acne scarring. Using NanoFractional Radio Frequency and SmartScan Technology to deliver energy through the epidermis to the dermis, generating heat, while stimulating fibroblast and rebuilding collagen. 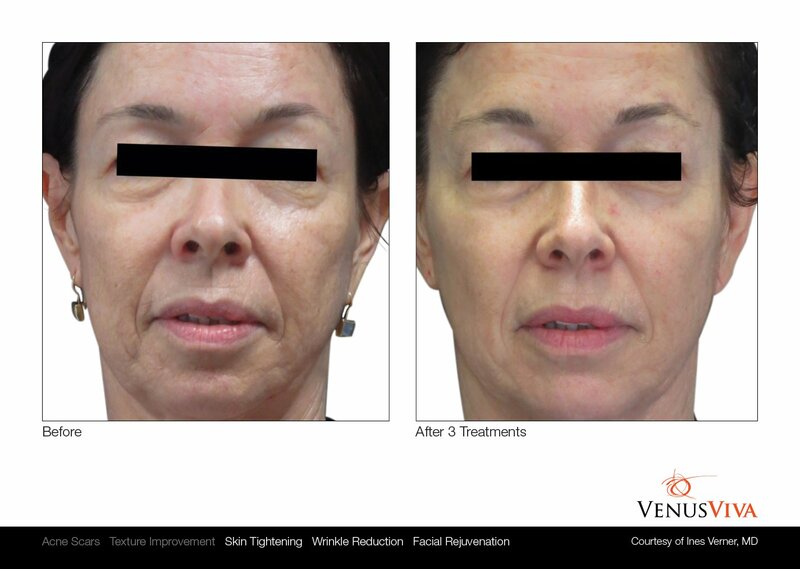 The Venus also uses microneedle technology to help the energy penetrate deeper into the dermis for faster healing time and better results. The Venus Viva hand device has a number of tiny pins at the tip. The pins pierce the surface delivering heat into the skin via NanoFractional RF™. At the same time the non-invasive Diamond Polar™ applicator uses multi-polar radio frequency and pulsed electro magnetic fields to create consistent heat across the skin. Together the pinpricks and heat create micro-dermal wounds. As the wounds heal the surface level skin damage is repaired and collagen production is boosted. To ensure that you are comfortable during the procedure, your provider will use a topical anesthetic. Most patients handle the treatment very well, and any discomfort is minimal. It is well tolerated by patients and there is minimal downtime required – It is normal to experience one or two days of redness after the treatment. You may resume your recommended skincare regimen 24 hours after treatment. Shortly after the treatment there will be moderate redness and some light swelling of the treated zone in patterns the size of the treatment applicator. The redness should stop after a few hours, and the swelling should go down within 12-24 hours. You should not use any aggressive products for about a week. You may experience itchiness. Do not scratch, itch, or pick at the sites. After about 24-72 hours, you will notice small pin-point crusts in each ablated spot where the electrode pins of the treatment head contacted the skin. These will naturally exfoliate and can easily be covered with makeup. On Average, it takes 3-6 treatments spaced out every 4 weeks apart for desired results. Based on your consultation, your provider will assess your skin and speak with you about your goals. You will receive a customized treatment plan that will achieve the best possible results.